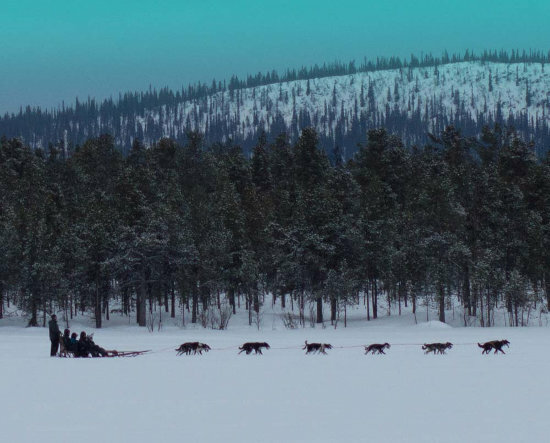 In Europe's last wilderness, few things can be more awe inspiring than to sit on a Sled pulled through the snow by 12 powerful Alaskan Huskies. In our beautiful winter wonderland you may very well see Reindeer and Moose roaming freely in the wonderful snow covered forests as well as P´tarmigan, Capercaillie and Siberian Jay roaming the skies. Our experienced guides will introduce you to the dogs and you will have the opportunity to take many wonderful pictures. We stop halfway at our warm wilderness cabin for a 'Fika' and some cookies before returning across expansive and often spectacular frozen lakes. 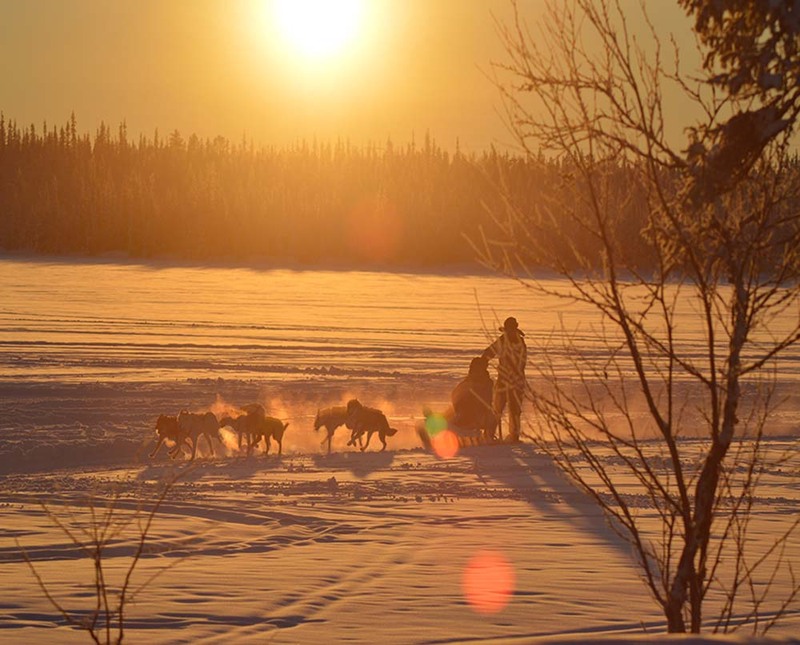 Travel across truly amazing landscapes with only the sound of your fantastic Sled Dog Team breathing and the your sleds runners cutting through the ice and snow. 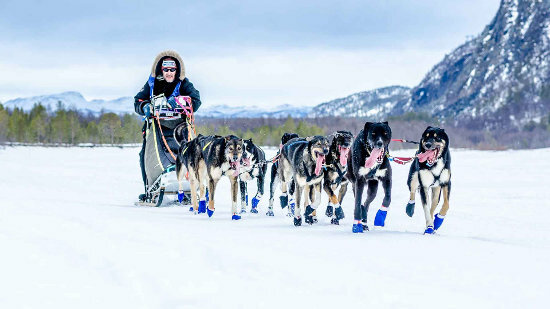 You have the choice to drive your own team of Huskies or be driven by our guides. You and your Husky team will travel through forest sections often covered in beautiful shining snow and across frozen rivers and lakes. We take a lunch break to enjoy some local traditional cusine of soup with Reindeer and Vegetables before setting of into the sunset with your enthusiatic team of Alaskan Huskies. 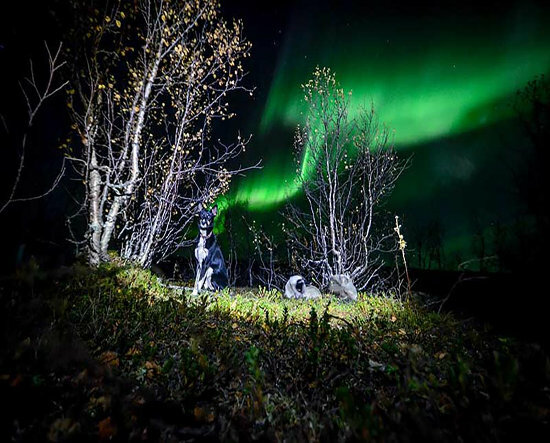 Few things are as special as experiencing the brilliance of the Aurora Borealis dancing brightly above you, especially whilst riding on a dogsled pulled by some world class Alaskan Huskies, through the amazing lapland wilderness. Sit back and enjoy the trip! Take photos of the Northern Lights if we see them and the fabulous Huskies. We take a short break for a 'Fika' and cookies in our warm cabin before heading back under the moonlight over the glittering snow and ice. 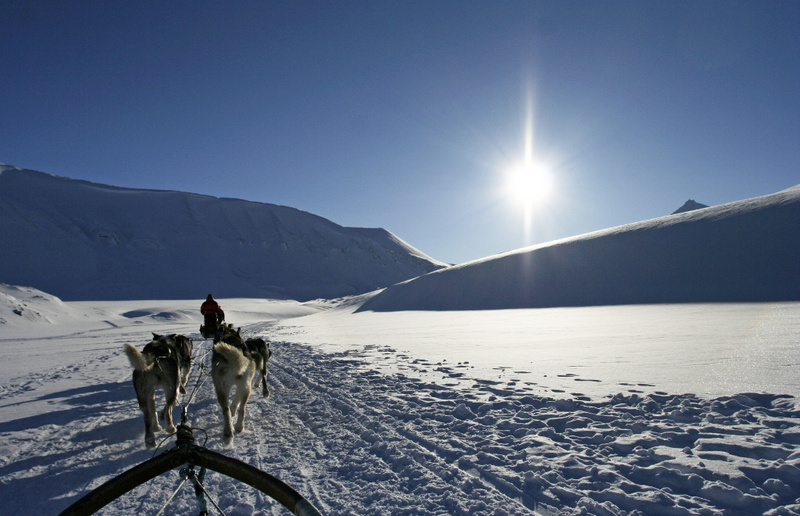 We pick you up late afternoon and you drive your own team of Huskies through the winter paradise. You have the option not to drive and sit on the guide's sled but please let us know in advance. We travel to a Wilderness Cabin where you can enjoy a delicious 3 course dinner after we feed the dog teams. In the morning we cook breakfast, then we feed the dogs and prepare ourselves and our furry friends for the journey back to the main camp. NEW YEAR SPECIAL: Dec 31 - Jan 1 2017. SPECIAL NEW YEAR DINER & CHAMPAGNE - 7000 Sek per/person. Join us on a fantastic trip of a lifetime through the amazing surreal lappish interior. Three to five epic days of driving your own dog team across breathtaking terrain. With our guidance you will care for your own dog team and experience what it really is like to be a musher in cold climates. 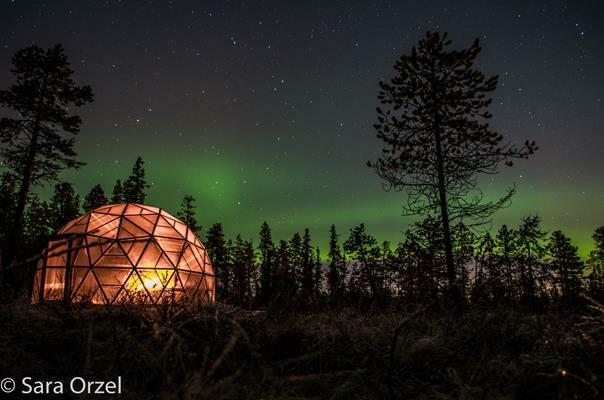 The Aurora Dome is one of the few constructions of it's type in Lapland. With a cosy wood burning fire inside and full 360 degrees windowed interior, you have a fantastic view of The Northern Lights whilst enjoying a traditional Fika. An amazing experience sheltered from the cold wind and snow in a comfortable seated environment. Here we will walk either by foot or if possible snowshoes through the beautiful snow draped white forests from our Paksuniemi camp. We also serve you a delightful mushroom soup with bread to keep you warm while we eagerly await The splendor of the Aurora to arrive. If the Aurora comes out to Dance, which often she does this time of year, you can be sure of an experience you will be telling people about for years to come. TOURS AVAILABLE FROM NOVEMBER 1st UNTIL APRIL 15th. Six days in the wild, quite simply an adventure of a lifetime as you drive your own team of Alaskan Huskies through scenery that will quite simply blow your mind! In April we have longer days, early spring sunshine and milder temperatures. This usually ensures lovely long days of mushing travelling between 50km to 90km per day. After departure from our Kauppinen base we travel up to The Tundra and Mountain Area west of Övre Soppero, through Kaamas, Rostujavre and Pältsa before returning back to our base camp 5 days later. Each day after mushing we look after our dog team and then work together to prepare the cabin or the camp we will be staying at. We will enjoy some local food throughout our journey and after a good night’s rest be ready after breakfast to hit the trail again. Tour Length: 6 Days in duration from APRIL 17th - 22nd 2017. 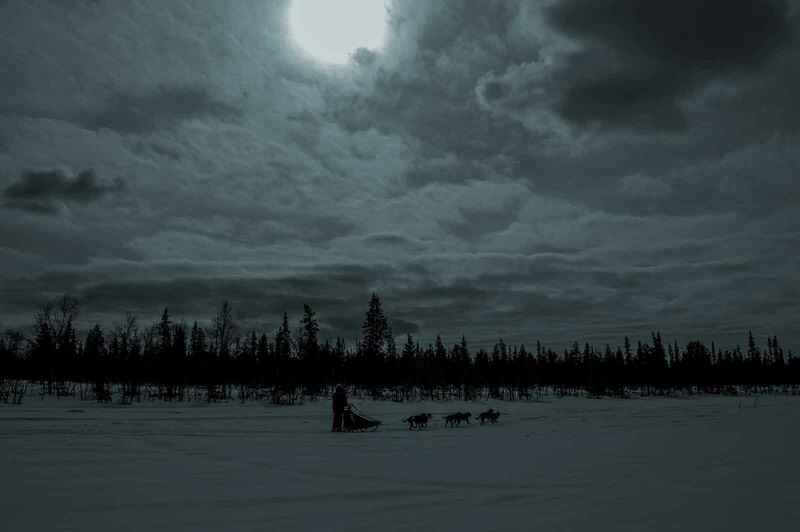 Overnight Super Tour with world class sled dog teams. This is a unique trip that you can’t book with anyone else – Anywhere !! We will be working with some of the best Huskies in our kennel, many of these dogs have raced in some of the worlds top sled dog races. You can drive your own team or you can sit on the sled. We will be driving a minimum of 120km with short breaks in between to rest ourselves and the dogs. You will drive in some fantastic scenery through snow covered forests and across immense frozen rivers and lakes. At our stopover in Övre Soppero for the evening we will feed and water our fantastic canine athletes and thank them for a great trip. After which we spend the evening with a local Sami family of reindeer herders and have diner with them. You can probably guess what’s for diner. In the morning we fuel up with some breakfast, feed and prepare the dogs for our return journey…..and we are off again driving with our fantastic dogs. 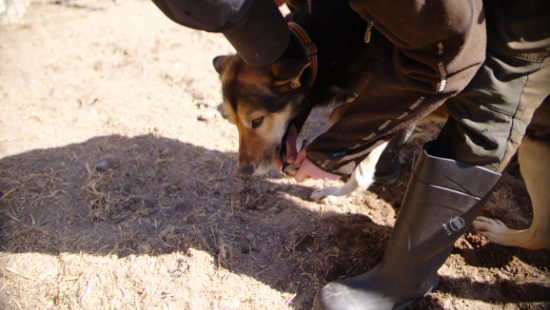 During mid August – end of November we will run an intense course for individuals who are interested in working in a sled dog kennel. 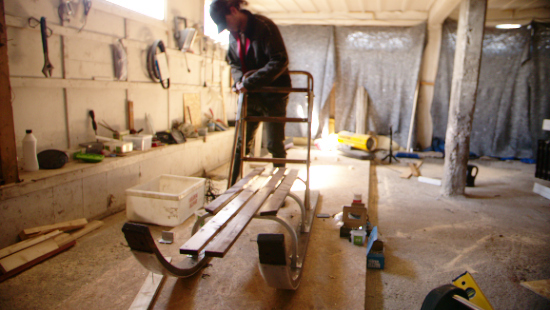 If you are interested and eager to learn, you will learn enough in 6-12 weeks to be considered for employment in most sleddog kennels worldwide. The first two weeks is mostly kennel duties, like feeding, caring , fixing, repairing gear and driving with trailer particularly in reverse. From the third week we add more dog training and some theory lessons in “trail behaviour”, how to make fire and camp and cook on trail and in some of our wilderness cabins. Later after the snow falls. 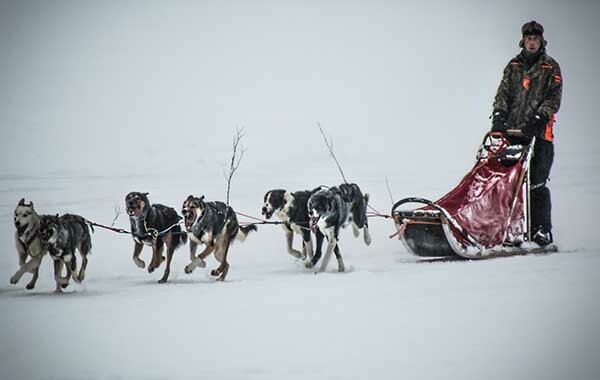 You will learn to drive a sled yourself, and this will continue until we have you to the standard of being able to safely navigate a trail in numerous weather conditions with up to 4 guests on the sled and 14 dogs under your command. Your main teacher will be Taisto Torneus, a professional wilderness guide for over 30 years, multiple times Swedish & Scandinavian long distance champion and recently this year 2017 middle distance world championship silver medalist. The other professional guides at Lapland Wilderness Tours will also be responsible for part of your training programme. This programme is not for the feint hearted ! However, after successfully completing the course with dedication and drive you will most certainly be ready and equipped with the knowledge and experience enabling you drive large dog teams and look after yourself and guests in a variety of challenging conditions. You begin the course on agreement and quit when you want or have attained the level of knowledge you are satisfied with. Course Duration: 6 - 12 Weeks. Or to the point you have attained adequate knowledge/ experience. Maximum Students: 6 people at the same time. During this intensive musher course, we will cover everything from the basics to the more advanced aspects of Dog Sledding. 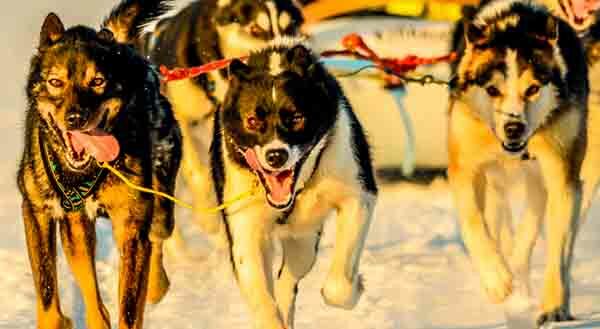 We will cover the many details regarding caring, feeding, training and driving international champion Sleddogs. This course is very hands-on and involved for those who have the passion, commitment and drive to learn as much as possible. The main concept is that we will do things together first and once you have the general idea you will then do it yourself without the assistance of anyone else. If you are a total beginner we will spend more me on the basics in order to allow you me to grasp the principles, ideas and processes of the various skills required. If you have prior experience then we will start at a more advanced level. The maximum amount of people allowed on the course will be 4 in order to ensure that we have time to teach everyone individually as well as in a group. Please apply quickly as we receive many requests each year for these positions. The objective is that you finish the course with a solo overnight dog sledding trip, where you will put up your own camp and take care of yourself and your dog team without any outside assistance. (If required, your teacher is only a phone call away if you need advice or help). After completing this course, you should be more than capable of handling a sled dog team on your own in a Sub‐Arctic climate. 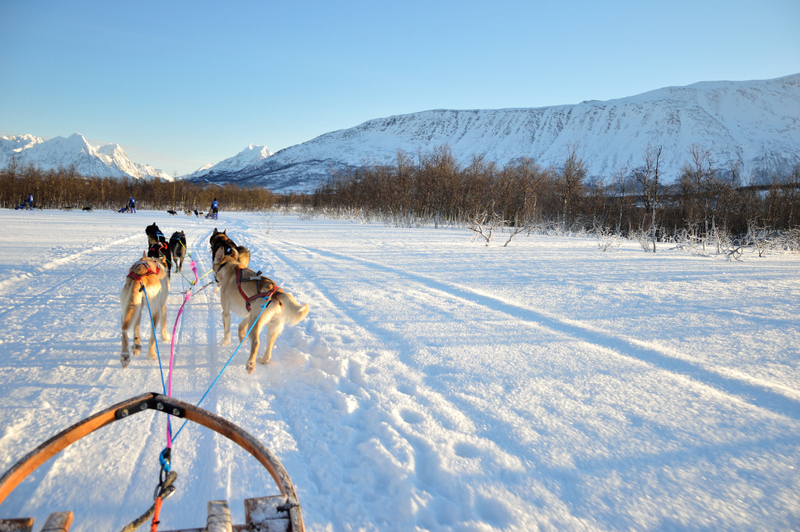 Course Price: 25,000 SEK/ Person, includes food, lodging, dogs and all equipment required. Enjoy with us an excellent snowmobile adventure in a small group; We take no more than eight clients on this beautiful ride in a relaxed fashion with less unwanted stops. We will drive through the amazing scenery of Lapland where you will travel across the immense frozen Torne river passing the world famous Ice Hotel. If you are lucky when we go through the snow covered forests, you may also catch a glimpse at a Reindeer or a Moose. We will also have a lovely Fika (Swedish Coffee) or Tea if you prefer at some point on your journey. Tour Length: Will we ride approx 40km. Tour Times: This tour is available on even days only, i.e. (2nd, 4th, 6th of each month) We will collect you from Kiruna area (within a 20km radius of our base in Kauppinen) Pick Up: 12:00 - 15:30/16:00 approx. 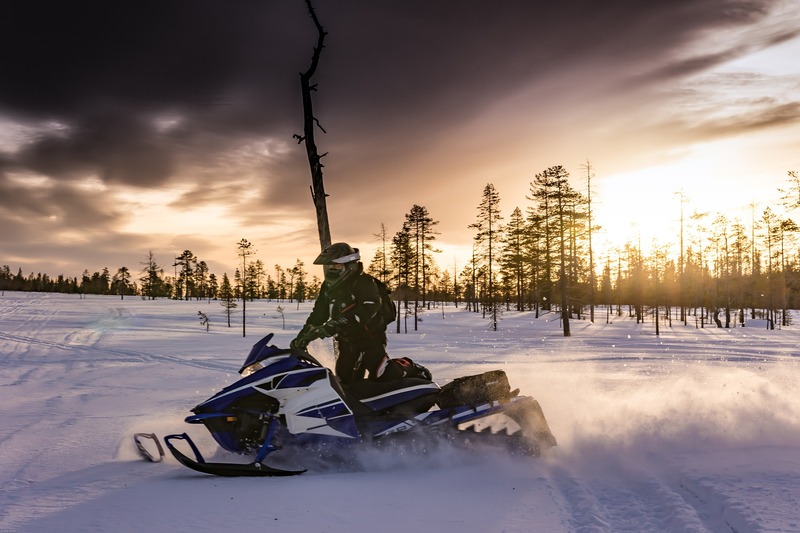 Price: 1500 SEK/person (2 persons share a snowmobile), for your own snowmobile the price is 2000 SEK/person. Group Size: Min 4 persons, Max 8 persons. Transportation: FREE transfers (within 20km radius or our base in Kauppinen) and winter clothing included. Our epic mountain tours drive through the high Swedish mountain area, we may begin and end at different locations depending on the ever unpredictable weather and snow conditions. You will pass through deep arctic valleys and climb to spectacular high altitudes with your dog team. The downhills are Adrenalin filled and the uphills will often take a bit of effort on your part where you work in unison with your world class trained dog team in order to move through the Lapland Fjälls. On a good day the scenery is nothing short of breathtaking, surrounded by blue skies and spectacular mountains all around you, but sometimes when the snow and wind arrive you will see nothing but the sled in front of you with next to zero visibility. We will stay in a selection of simple but warm and comfortable cabins scattered throughout the mountain area, with no electricity and water either from a well or created by us from snow. Sometimes we will have to stop if the weather becomes extreme to put up a tent or shelter and wait for some calm. This trip can vary from easy to physically demanding, so a reasonable level of fitness is required, should you have any medical conditions that you are concerned about, please make us aware of this before booking. Minimum 4 dogs/team, Max. 6 guests/guide.